At your summer barbecue or 4th of July party, serve your drinks with fun straws! Download the printable by clicking the link above. Fold the circles in half and cut a slit. Then fold the other direction and cut a second slit along the cut lines. Slip each circle into a straw, as shown. You’ll want to mix up lots of yummy kids party drinks to enjoy these fun straws all summer long. 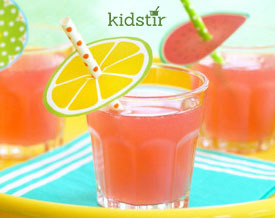 We promise you’ll have some new favorites from our Summer Sips Kit, which has healthy kids drinks recipes, along with some tasty treats for summer. Little chefs might not even notice the math, science, reading, and nutrition that’s tucked into all the family fun! Happy sipping!